Notice: Due to a family illness the studio is closed until further notice. Welcome to the gallery of glassblower and artist Glenn Randle. This is my portfolio, gallery, and catalog. It will continue to grow over time as I develop new designs and work on various projects. 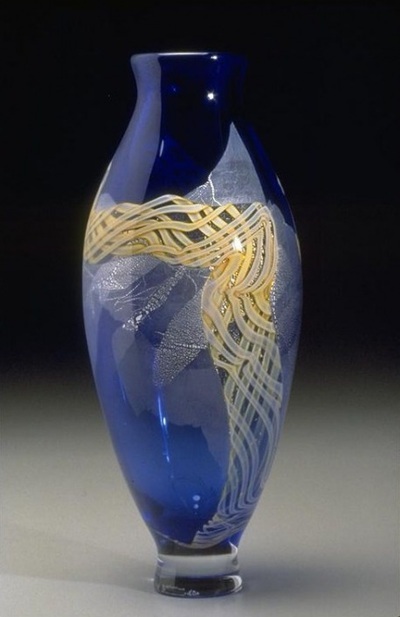 I have made vases, sculpture, paperweights, and ornaments since I opened Fire Dancers Glass in 1997. Presently, I am concentrating my efforts on making hand blown glass sinks. Making such large & heavy blown glass bowls is a challenge that I am really enjoying. It took me a while to get the studio set up to be able to make them safely with only one assistant. Realizing the possibilities that I now have is really exciting...and I am looking forward to the future. The Furnace is the "Heart of the Studio"
The furnace contains a crucible full of crystal clear glass. It runs 24 hours a day to keep the glass at 2000+ degrees Fahrenheit. 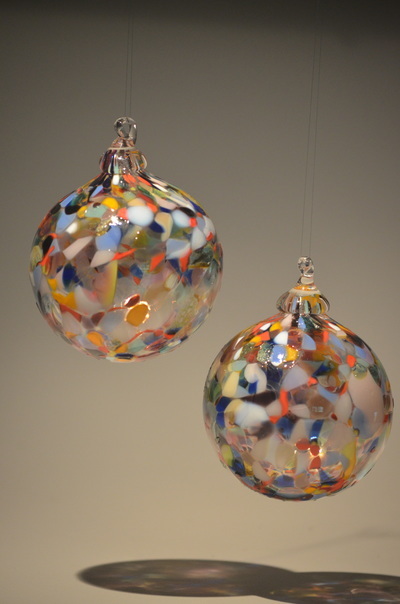 Glass objects are made by gathering glass onto the blowbipe (or punty for solid pieces). Each gather adds another layer of glass. 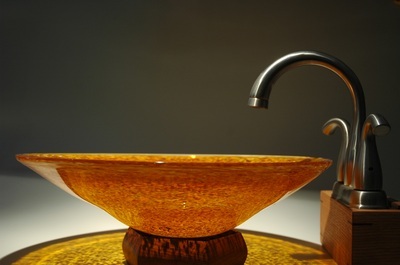 Small ornaments only require one gather, while heavy glass sinks require 4 or 5 gathers. Thinner gathers can be taken by increasing the furnace temperature, while a cooler furnace allows gathering thicker layers. Experience tells the glassblower which temperatures are best for what he is planning to create. This is a fresh gather of hot glass just coming from the furnace. It's too hot to begin working with at the moment, but in less than a minute it will be stable enough to begin shaping and decorating. Rolling the piece across colored glass frit picks up the color onto the hot glass. Colors may be applied to any layer between gathers, layer color after color, or various colors may be mixed before applying. There is a wide variety of choices of how to apply colors. note: Frit is only one form that colors may be applied. Solid color is available in rod/bars, and powdered color is also used for a variety of effects. You're probably wondering how the colored glass is made to begin with, right? Clear glass is colored by melting various metal oxides (rust is iron oxide) into the melt. Different oxides produce different colors. Cobalt makes blue, gold makes ruby, etc. There is a lot of chemistry involved in producing the rainbow of colors that can be obtained. Most glassblowers choose to use factory made colors because this allows them to only keep one furnace full of clear crystal glass and then add colors from a wide pallet, just like painters adding color to a canvas. This is how a large bowl looks after being transferred from the blowpipe to the punty. The hole is where it had been attached to the blowpipe. The orange color is from the heat, the true colors will appear after the glass has cooled.